So you’re going to host a wedding shower or bridal shower (or groom’s shower?) but you want a theme . . . and you don’t know what theme you want! Maybe something . . . different? This list will help you brainstorm! 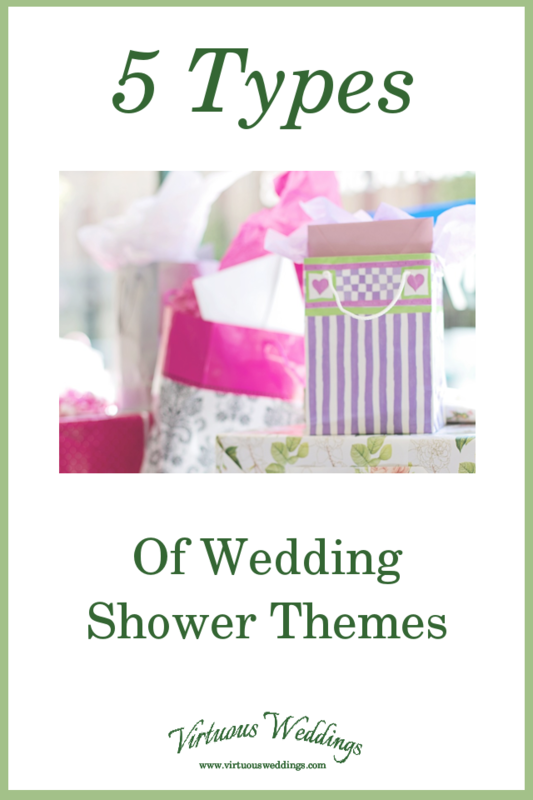 There are five categories of wedding shower themes below, with lots of possibilities within each. #1 A common or traditional theme. This would be something typical and expected, such as a bridal tea or a basic household shower. This works just fine, although it’s definitely not “different”! #2 A theme based on a specific home-related activity. Maybe cooking or housecleaning. Guests buy the tools and supplies for that activity. More ideas: gardening, laundry, home maintenance, preserving, sewing. #3 A theme based on a particular room or rooms within a house. You could have a kitchen shower, a living room shower, a dining shower, or a bed and bath shower, for example. Or go for a household shower with a twist: an around-the-house shower (for which different each guest is assigned a room to buy gifts for). #4 A theme that focuses on a particular holiday, celebration, or season. Or one that covers all of them. Ideas: general celebration, Christmas, Thanksgiving, winter, spring, summer, fall. Gifts could be themed (Thanksgiving decor, gift wrapping supplies, things the couple would use in the fall, etc.) or not. This could be flowers, butterflies, pincushions, vintage china, frogs. . . . Whatever works! Choose something that is meaningful to the couple/bride/groom. Better yet, choose something they’ll like but that you already have, for frugal decor. If it’s a theme they especially love, you could carry it through to the gifts. More ideas: antiques, owls, birds, animals, fruit, vegetables, musical instruments, trains, books. How many ideas can you come up with using these theme categories? Printable Proverbs 31 Bridal Shower Games!